Introduction: Vitamin D and the antioxidant quercetin, are promising agents for improving physical performance because of their possible beneficial effects on muscular strength and cardiorespiratory fitness. Purpose: The purpose of this study was to determine the effects of increased intakes of vitamin D, quercetin, and their combination on antioxidant status, the steroid hormone regulators of muscle function, and measures of physical performance in apparently healthy male adults engaged in moderate-to-vigorous-intensity exercise training. Methods: A total of 40 adult male participants were randomized to either 4,000 IU vitamin D/d, 1,000 mg/d quercetin, vitamin D plus quercetin, or placebo for 8 weeks. Measures of cardiorespiratory fitness and muscle function, blood markers for antioxidant and vitamin D status, and hormones 1,25-dihydroxyvitamin D3 (1,25(OH)2D3) and testosterone were measured pre- and postsupplementation. Results: At enrollment, 88.6% of participants were vitamin D sufficient (serum 25-hydroxyvitamin D >50 nmol/L) and had normal serum testosterone levels. Supplementation with vitamin D significantly increased serum 25(OH)D concentration (by 87.3% in the vitamin D group, P<0.001) and was associated with an increasing trend of testosterone concentration. There were no changes in concentration of 1,25(OH)2D3 and markers of antioxidant status associated with vitamin D or quercetin supplementation. No improvements in physical performance measures associated with vitamin D and quercetin supplementation were found. 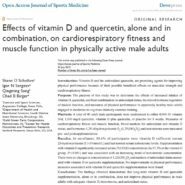 Conclusion: The findings obtained demonstrate that long-term vitamin D and quercetin supplementation, alone or in combination, does not improve physical performance in male adults with adequate vitamin D, testosterone, and antioxidant status.